Okay, I don’t think it’s fair to complain about the Schulz estate “selling out” and making a Snoopy video game, if only because Charles Schulz himself was entirely willing to stick Snoopy on tons and tons of merchandise for the purpose of making a lot of money. And in fairness, the idea of a Snoopy flying ace game is actually a pretty clever one, and the game looks like it could be fun. So that’s good. The idea of having Zee Germans in this game be Schulz kids is just freakish and weird and wrong on so many levels. And if memory serves, this isn’t the first time they’ve tried this. Unless I hallucinated “Snoopy’s Magic Show” for the Game Boy. A non-zero possibility. Indeed. They should be adults, who speak in “bawbawbawww” – but with German accents. Somewhere, somehow, there’s a Sgt. Schultz from HOGAN’S HEROES joke to be made here, but at my bleary morning state I fail at life and everything. I’m not as disturbed by this as I would expect. But I’m just hoping they’ll be some cut scenes with Snoopy sipping root bear in a shadowy French bar. Because otherwise, it’s a waste of gold. Me being me, I designed level maps for this game when I was nine. I can’t remember what I’d decided the enemy should look like. What was the alternative, though? Adults are never seen in the Peanuts universe, so there are no design models to use. Besides, they’re adorable Germans. That should count for something. Well, it’s not like they’re WWII era Germans. Or maybe that would cross the line twice back into cute? 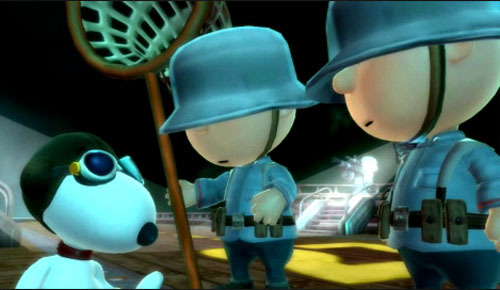 One has to wonder whether or not they’re going to license the Royal Guardsmen Snoopy/Red Baron songs for the game…. I always got a grand kick out of the “commercialization is bad” message in the Peanuts Christmas speical being broken up by those same characters selling us Dolly Madison snacks and insurance. Well, commercializing Christmas might be bad, but there’s no reason a red-blooded American can’t enjoy affordable flood coverage and some zingers. 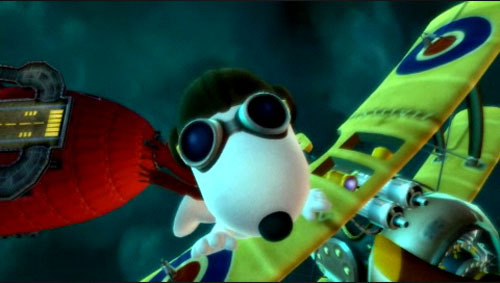 This isn’t even the first “Snoopy and the Red Baron” game. There was also one for the Atari 2600, with surprisingly good graphics.